Sharing the Peace of Christ during the ordination of Rev. Leigh Benish, Sept. 2013. We invite you to visit us! When you enter the church, you'll be welcomed by our greeters and given a bulletin by our ushers. Please sign our guestbook! Typically people wear casual dress for worship. 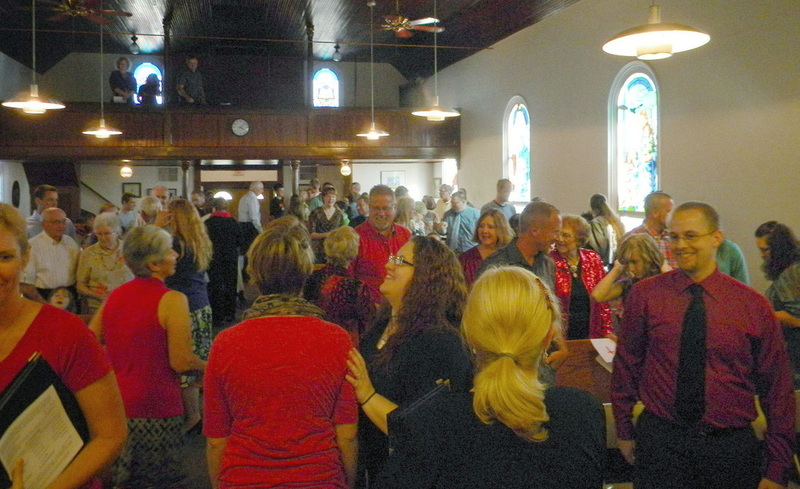 When the service reaches "GREETING ONE ANOTHER and SHARING THE PEACE OF CHRIST" you'll see everyone rise and begin shaking hands and conversing with each other. Don't be shy. Reach for the hands offered to you and introduce yourself. If it is Holy Communion Sunday, all baptized persons are invited to participate. You'll find communion participation instructions printed in the bulletin. There is an equipped play room on the lower level for your use should your child need a break during worship. Ask an usher for directions. Bathrooms are also located on the lower level. Sunday School is provided for all ages (Sept. through May). Visitors are always welcome to join in. After worship, join us downstairs in Fellowship Hall for coffee, beverages, treats and conversation. Thank you for visiting!